Crabtree & Evelyn Refreshing Body Mist, La Source, 4 Fl. oz. Product prices and availability are accurate as of 2019-04-21 00:06:07 EDT and are subject to change. Any price and availability information displayed on http://www.amazon.com/ at the time of purchase will apply to the purchase of this product. An ocean-enriched wake up call for the senses. 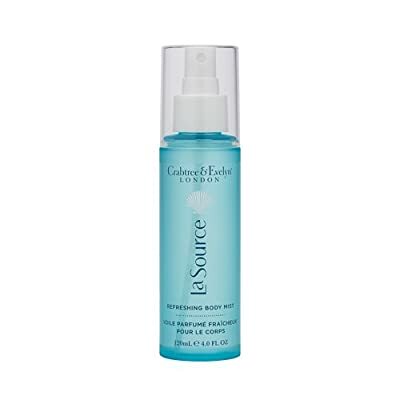 Our La Source Refreshing Body Mist features an antioxidant-rich green seaweed extract and amino acid blend to condition skin, leaving it revitalized. With every gentle spritz comes a fragrant burst of crisp ocean breezes, marine aromas and fresh essences of stimulating peppermint. Green seaweed extract enhances the skin’s natural protective barrier. Amino acid blend moisturizes and conditions skin. Formulated without color, mineral oil, parabens, phthalates or propylene glycol. Dermatologist tested and approved.